Recently I edited a video for visual artist CortesNyc displaying his masterful airbrushing technique. 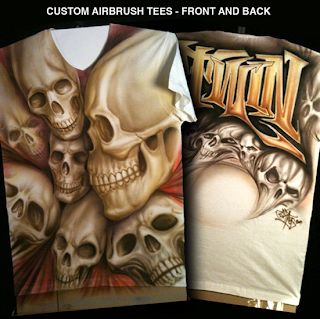 Cortes was commissioned to air brush skulls on a t-shirt. While going through the footage, I realized that this artist can simply master any medium. This was a fun promo video to work on and I can't wait to see what he airbrushes next. If you enjoyed the work and want your very own custom shirt check out CortesNyc's Online Store.